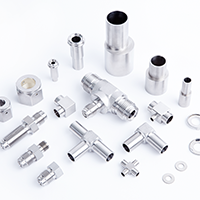 DK-lok offers a complete line of Face Seal, Micro-Fit Weld, and Tube Weld fittings for “Clean” industry applications such as the Semi-conductor, Bio-Tech and Pharmaceutical industries. These products provide a high purity metal to metal seal with leak tight performance from vacuum service to positive pressures. Available in several grades of material with special cleaning for high purity evironments assembled and packaged in Class 10 and Class 100 clean room environments based on customer requirements.